Another Fubonn purchase. I've never had good luck with sardines packed in round cans. Most of the ones I have tried have been of Mexican origin, too big and/or mushy and typically in some kind of sauce. I'm sort of a purist when it comes to these things, but every once in a while I'll be intrigued by a bit of cool or weird labeling and take the plunge. 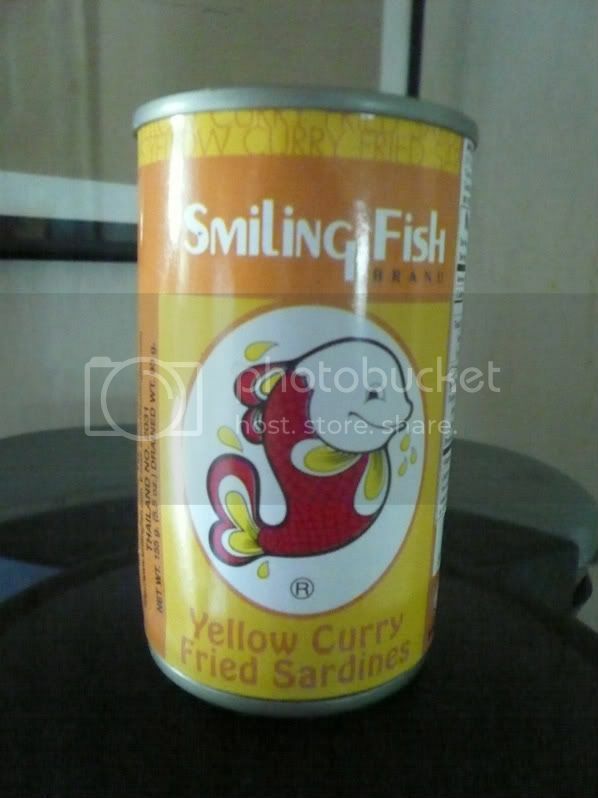 I brought a tin of these Thai "Smiling Fish" brand sardines out to Les Bois for Mr. Chris to help me test. They are fried and packed in yellow curry. That is about the best thing I can say about them. Certainly the first time I've put Sriracha sauce on tinned fish, but it seemed appropriate here, considering their origin, and the vileness of the product. Mr. Chris and 'Ningo polished off the can and seemed happy about it. I had two crackers worth and threw in the towel. Cool packaging and an intriguing idea, but poorly executed. Two Tins out of five.